With the exception of the one overriding theme each Sunday on Game of Thrones - the battle for King Joffrey's iron chair - it's difficult to tie most episodes together under a single umbrella or motif. This is a series that unspools so many arcs on a weekly basis that it's challenging enough to keep up, let alone find a common tread to unite every character or storyline. But something Davos said stood out to me on "The Ghost of Harrenhal." Various individuals found themselves facing some hard truths this week. We have to start with Davos himself and his conversation with Stannis. I complained a bit last week over the conclusion to "Garden of Bones," fearing Melisandre's birth smoke, and magic in general, would take on a significant role on Game of Thrones, overtaking the plots and manipulations of the human beings themselves. So I was relieved here to see it, instead, used as a way to shine a light on the relationship between Davos and Stannis. 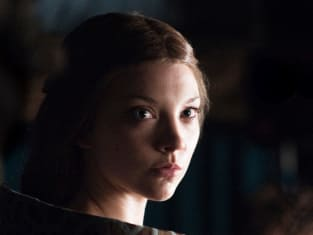 The former made the legitimate point that it's dangerous to trust someone with such capabilities because who's to say she won't use them to usurp Stannis? Who's to say she isn't using him even more than he's using her, to get into King's Landing and eventually sit on the throne herself? Heck, who would be able to stop her? This is a case where perhaps it would serve the viewer well to have read the books - Carissa Pavlica as done so; read her GoT review from a novel fan's perspective now - as I'd have to imagine more time is spent on them delving into the bond between Melisandre and Stannis. For someone such as myself who only knows GoT as a TV program, we've simply been introduced to the duo together and have no idea where or how the relationship started. From what we do know, Davos is clearly correct. Yes, Renly was taken out with ease and, yes, his men now side with Stannis - but it would be a mistake to bring Melisandre along for the real battle. It's a hard truth Stannis claims to accept, but I have my doubts. 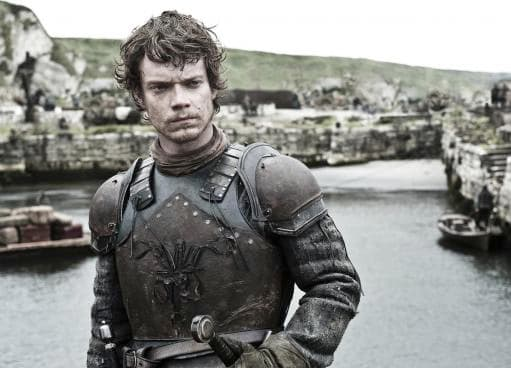 Theon, meanwhile, also needed a cohort to slam some sense into him: no one will buy him as a commander unless he proves capable. Ransacking a defenseless fishing village? Please. Going further up north and rampaging a Winterfell stronghold? That will make a serious dent. It will also forever sever any ties with the Starks, a reality Theon - at least in this moment - doesn't seem to mind one bit. He relishes it. He's been reduced to your basic ignored son, desperate to please and impress his father. At the cost of how many lives, though? Elsewhere, Daenerys now knows the cost - the hard truth - of accepting entrance into Qarth: her hand in marriage, her womb to hold the many desired children of Xaro Xhoan Daxos. This wealthy man's intentions aren't exactly pure, but they aren't unreasonable, either. Robb has been promised to a woman in exchange for passage that will help him avenge his father's death. It's not unrealistic to make sacrifices, often in the heart or of the flesh, to attain your goals in these dangerous situations. And, really, there are worse fates that marrying Xaro Xhoan Daxos, reaping his riches and sitting on the throne you believe to be your birthright. But Daenerys, for all her bravery and occasionally violent exterior, is really a softie. She's a dreamer. Jorah sees that. He totally crushes on her because of it and his passionate speech to his boss appears to have changed her mind. The appeal to Dany's emotion has superseded the appeal by Xaro to her brain... but, again, at what cost? I, too, admire the Mother of Dragons for her hopeful view of how everything will turn out, but it might require more than a strong belief at some point. It might require the backing of an actual army. Then there's the Demon Monkey. Sorry, I mean Tyrion. The truth he faced this week was harsh, yet expected: Joffrey has no clue what he's doing. Following an inspired speech from Bronn - men win wars, not magic - Tyrion agreed that an abundance of fire water is a legitimately scary prospect for King's Landing to control. There are far too many variables at stake to assume all will successfully be catapulted into the chests of their enemy. So, instead, Tyrion wants the weapons to continue to be constructed... for him? Is the little man plotting a coup of some kind? Brienne cannot avenge Renly from the grave. She's now the loyal servant of Catelynn - and I do mean loyal, this is one committed woman! - who, in turn, made a moving pledge to Brienne. She will never ask anything of her that brings dishonor. Arya can simply ask Jaqen H'ghar to take the lives of any three men. The girl makes the request and the man will obey. That's a nice trump card to have in one's back pocket. For Jon Snow, there was the jolting revelation: he isn't a very good steward. But perhaps he'll make a better ranger, as he volunteers for a new, stealth assignment. The easy truth for me to admit? This was another enjoyable, complex, involved Game of Thrones episode. What did everyone else think overall and, specifically of Dany's decision: Should she accept Xaro's proposal? Yes, it will guarantee her the Iron Throne! No, she should follow her heart! Game of Thrones Round Table: "The Ghost of Harrenhal"